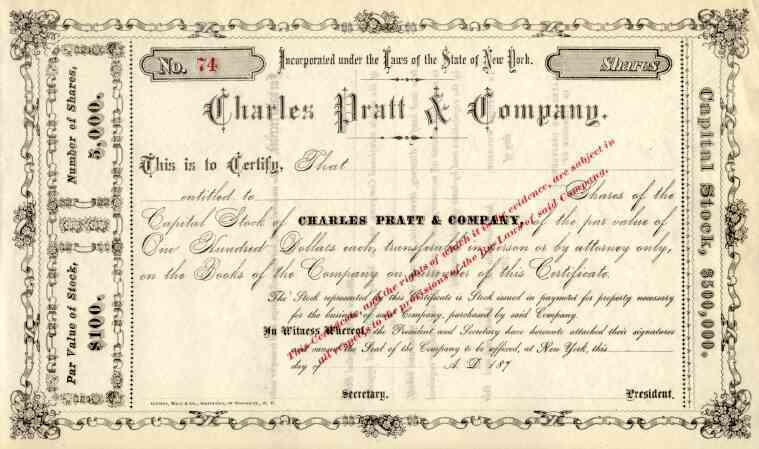 187_ Charles Pratt & Co Stock Certificate. Interesting history here. Charles Pratt (1830-1891) was a pioneer in the early U.S. petroleum industry. Recognizing the potential of replacing whale oil with petroleum distillates for lighting purposes, he invested in a kerosene refinery in Brooklyn, New York that he called Astral Oil Works. He met Henry H. Rogers and Charles Ellis and purchased their their small venture, Wamsutta Oil Refinery, located in McClintocksville near Oil City in Venango County Pennsylvania, which was in the midst of an oil boom following the successful completion of Drake's well along Oil Creek in 1859. Pratt invited Henry Rogers into his business, forming Charles Pratt and Company in 1867. In the early 1870s, Pratt and Rogers, along with other independent producers and refiners, led the opposition to John D. Rockefeller's infamous South Improvement Co, which obtained favorable shipping rates from the Pennsylvania Railroad through a secret system of rebates. Henry Rogers led the opposition, and negotiated with the railroads to post shipping prices available to all. John D. Rockefeller offered to buy Pratt and Roger's company and allowed Rogers to set the terms. Thus, Charles Pratt and Co (including Astral Oil) became one of the most important formerly independent refiners to become part of Rockefeller's Standard Oil Trust in 1874. Both Pratt and Rogers played key roles in Standard Oil for many years. (source: Wikipedia) These unissued Charles Pratt & Co certificates are not common -- a partial book with roughly 50 unissued certificates was found a few years ago. These are all that are known to exist. This scripophily document is in EF condition.